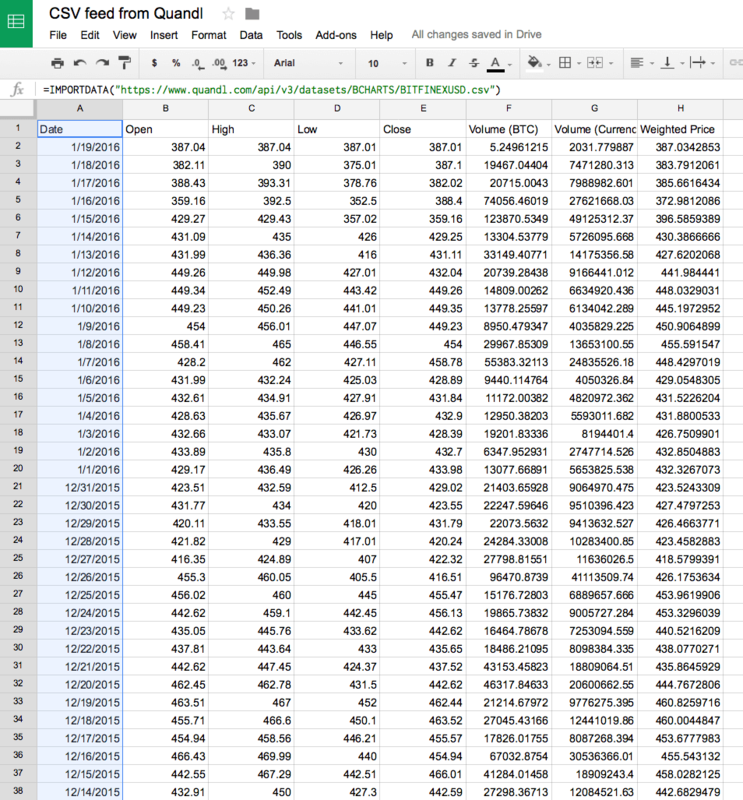 Google Sheets has a built-in function called ImportData which fetches data from a given url in CSV (comma-separated value) or TSV (tab-separated value) format. We'll show you how this function can be used with our Spreadsheets integration to display visualizations out of CSV files on Geckoboard. By default, the ImportData function doesn't update on its own if the spreadsheet is not being edited. We've written a script that you can adapt to ensure your data is kept up to date even when the spreadsheet is closed. Our Bitcoin exchange rate example below shows the basics of using this function and does not use this script. If you'd like your data to update automatically, you will need to create the script once the example is completed. The syntax of the ImportData function is IMPORTDATA(url), where url is the url from which to fetch the CSV or TSV-formatted data, including protocol (e.g. http://). 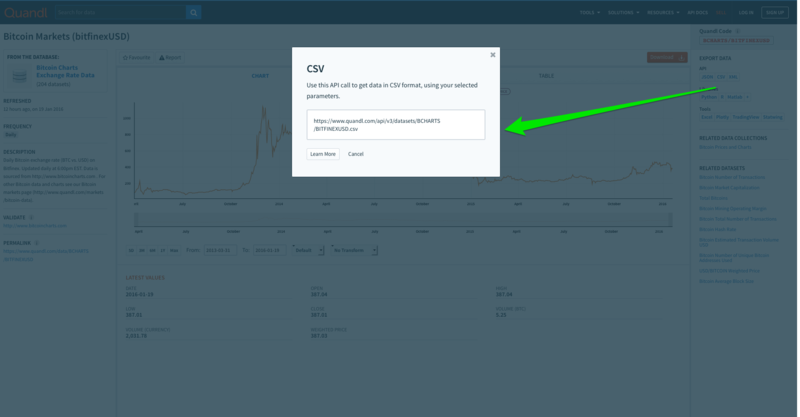 In this example, we'll use the ImportData function and the Spreadsheets integration to display Bitcoin's historic price (in $USD) on a dashboard, but more generally CSV files can help adding all sorts of proprietary data. Quandl helps data analysts save time, effort and money by delivering high-quality financial and economic data in the precise format they need. In this example, we'll use data in CSV format from their API. 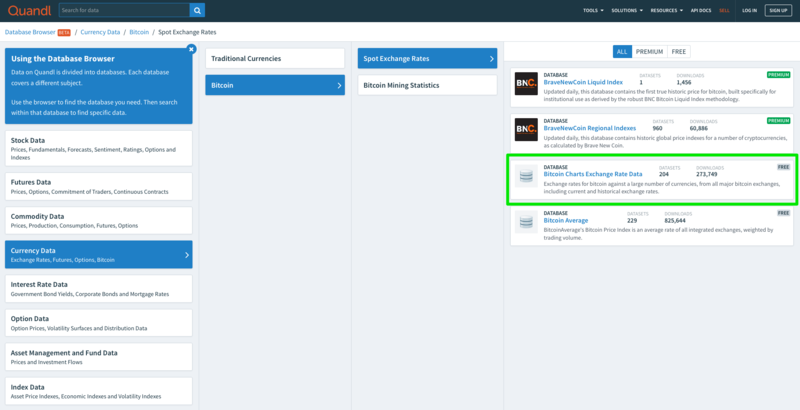 Use the Database browser to find Bitcoin's Spot Exchange Rates databases. We'll use Bitcoin Markets (bitfinexUSD) to demonstrate its usage. Once you find the database you are after, look for its Export Data menu on the right of your screen. You're now ready for Step 2! With Bitcoin's exchange rate information in your Google Sheet, create a new Spreadsheets widget in Geckoboard to display this information on the dashboard. Select the Line Chart widget (default). Enter the Date values (column A) as X-Axis. Enter the Close values (column E) as Series A. Leave the Goal and other Chart options Disabled and adjust the title. 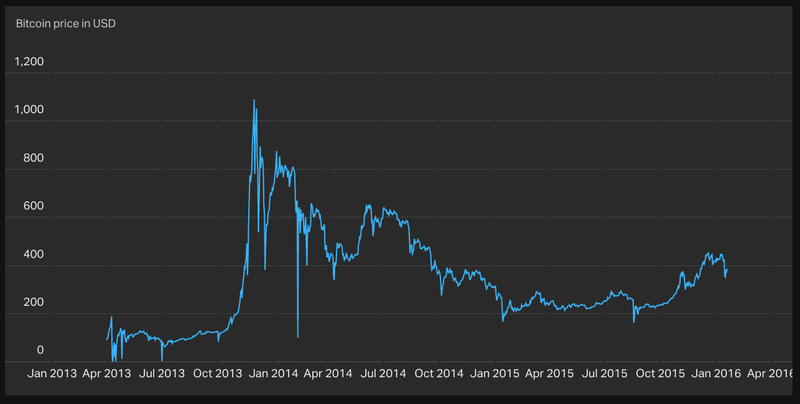 Geckoboard will plot a Line Chart with the information found in columns A and E on your dashboard - Bitcoin's exchange rate (historic) values. 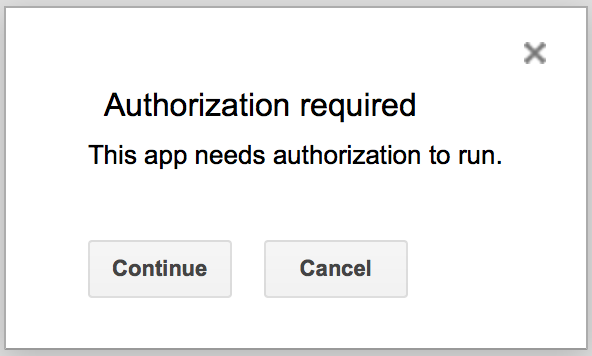 Unfortunately, the Google Sheets ImportData function doesn't automatically update. But you can adapt our script to update the market data every minute, even when the Google Sheet is closed. Make sure the cells in the your Sheet exactly match those in the script, otherwise your countdown will not update automatically. In the window that appears, click the link No triggers set up. This will create a trigger for your function. Change the default Hour timer to the one that best fits your needs. For this example Day timer as updating once per day will suffice. Now that you've written the script and set the trigger running, you'll be able to see the data on your Google Sheet refresh every minute. 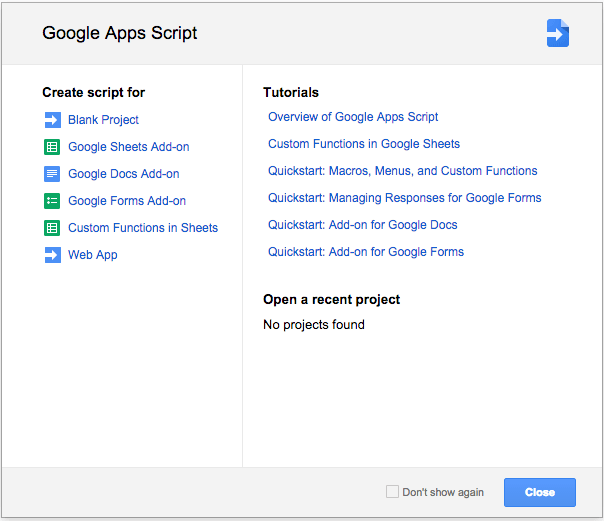 This will continue to refresh even when your Google Sheet is closed. 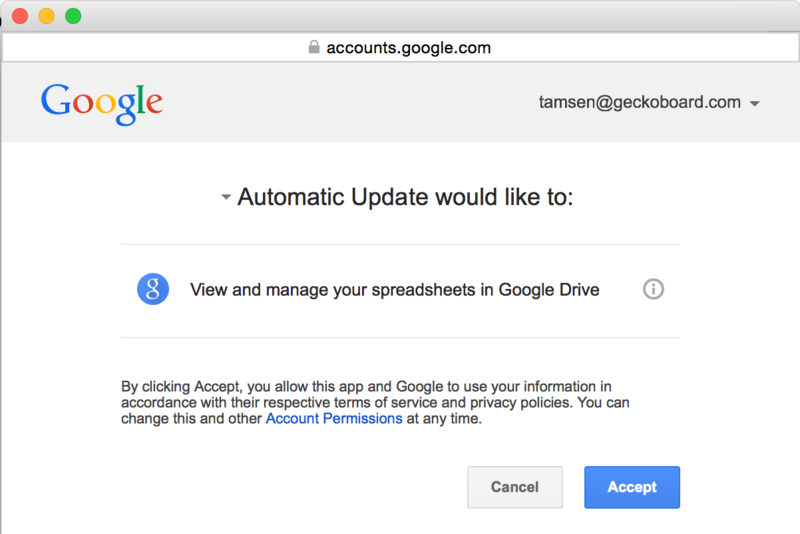 Your Geckoboard widgets don't require any changes to reflect the addition of this script and trigger; they will refresh every 15 minutes with the new data from your Google Sheet, just as they always have. The difference now is that your Google Sheet will have new data in it!